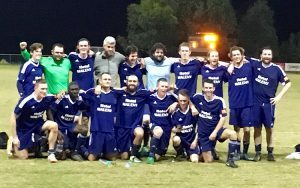 Maleny Rangers Men’s football team created history on Friday 9 September 2016, becoming the club’s first senior team to be crowned grand final champions. Scores of Maleny supporters made the trek north to Noosa to watch their team defeat perpetual grand finalists Buderim 1-0. 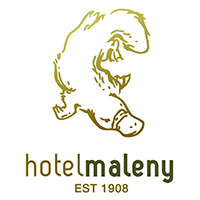 While Buderim claimed the premiership, Maleny entered the grand final as favourites after strong victories over their opponent in the last match of the regular season and a 5-2 victory in the major semi-final which saw Maleny Rangers progress directly to the grand final. 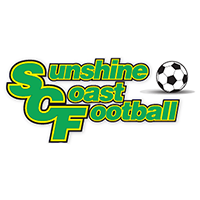 It was no surprise that player/coach, Coen Slaughter found himself a heavily marked man after he had scored an incredible 10 goals in the previous two encounters with Buderim, but within 5 minutes he was able to link up with right winger, Josh Campbell who delivered a perfectly weighted cross to Scott Whitaker who deftly volleyed home the goal. Maleny continued to dominate possession and build attacks with the best chances of the first half falling to Oliver Whitaker who cut in from the left wing, beating three defenders before rattling the post on the 20 minute mark and Ben Drew having a close range shot brilliantly saved a short time later. The loss of Drew to mild concussion and a knee injury was a major disruption to the team, but Maleny continued to control the match. Buderim’s only chances in the first half came from two counter attacks which were brilliantly thwarted by goal keeper Renato Pagliardi. On the stoke of half time, a thunderous 25m shot from John Cassidy just failed to dip in time to provide a safety buffer going into the break. The second half began as the first had ended with Maleny able to control the midfield and build from the back. Both captain James Lyne working in a central back combination with Troy Kemp were brilliant, shutting down any attacking play from Buderim. Cassidy and Slaughter continued to be dominant on the ball and create chances. Goal scoring opportunities were few and far between with long range shots from Campbell and Slaughter just off target. Maleny’s best chance of the second half came from a viciously curling free kick from Cassidy which was somehow tipped onto the cross bar by the keeper and the spinning rebound was unable to be put away by Madhu Kazony. As the game reached the 80 minute mark, Buderim desperately pushed forward to find an equaliser and stared to apply real pressure to the Maleny goal. Then, with two minutes left on the clock the real hero of the match emerged after a cracking shot from Buderim was miraculously pushed wide by man-of-the-match goal keeper Renato Pagliardi. As the ball cannoned into the upright, desperate and determined work by Caelen Dwyer saw the ball to safety. As the final whistle signalled the end of the match, the travelling supporters erupted in celebration and Maleny Rangers were rewarded for a great season of football. The Maleny Rangers Men’s team is: Max Altinger, Josh Campbell, John Cassidy, Alex Chigumbu, Alex Denmeade, Ben Drew,Caelen Dwyer, Madhu Kazony, Troy Kemp, David Knobel, James Lyne, Jak Mitchell-Mcgree, Geo Molinaro, Renato Pagliardi, Coen Slaughter, Andrew Smolders, Yarran Smyrell, Oliver Whitaker, Scott Whitaker and Mark Zonruiter.